To Be Gluten Free Homemade gluten free baking. I was originally inspired to find my place in the kitchen after seeing the movie Julia&Julia; I grew to admire Julia Child and her relentless will to succeed. I spent hours cooking with my mom and became confident making one of our family's most beloved dishes: banana cake. From there, I crafted my own recipes which caused me to apprecairte the time, skill, and level of mastery chefs must reach in order to make their mark in the culinary field. The techniques involved in the culinary arts stood out to me most of all. Buddy Valastro, the Cake Boss himself, mesmerized me with his intricate piping skills and attention to detail, and I dreamed of one day possessing the same capabilities. I knew hands-on practice was the only way to improve and I enhanced my experience in the kitchen by applying this understanding along with many others. 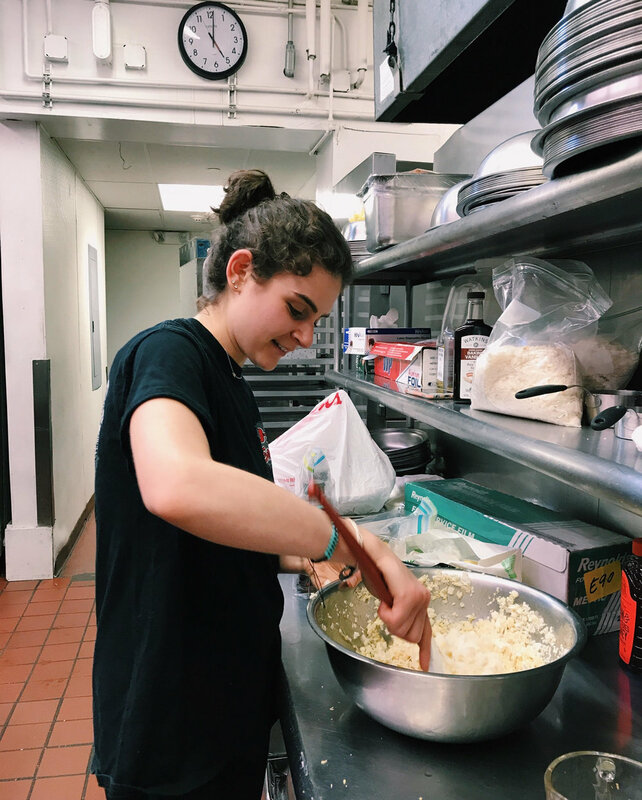 I tied my apron, grabbed my whisk, and began shaping my identity as a "chef-in-training." My brother was diagnosed with Celiac Disease in 2013 and soon after, my mom and I were diagnosed with gluten sensitivities as well. This called for a rapid change in our diets and initially made cooking very difficult and confusing. Eating and cooking according to a gluten free diet is something we had to learn about and experiment with, resulting in us ultimately perfecting the art; I like to think we were as relentless in our pursuit to whip up homemade gluten free lasagna as Julia Child was in her pursuit to master the Sole Meunière. "Deconstructed" gluten free lasagna... a Malin family classic! As time went by, I began to notice a lack of quality gluten free goods available in my community. Furthermore, I saw how devastating it was to my elementary school brother when he was the only child at a birthday party who couldn't have a slice of cake. I was then motivated to master the art of gluten free baking and provide my brother with easily accessible, safe-to-eat food. 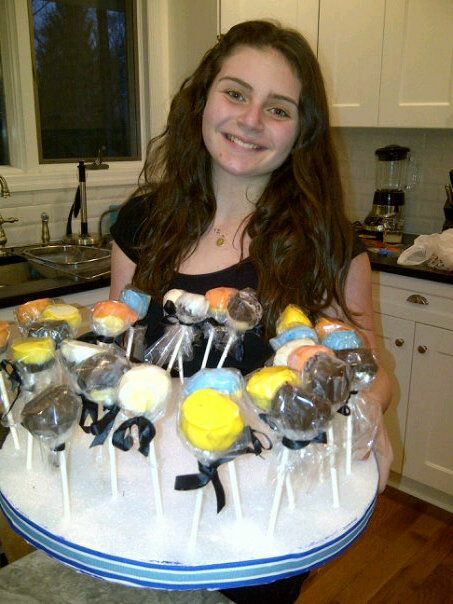 Gluten free cake-pops I made for my brother in 2013. To Be Gluten Free originated as a "food-stagram" on Instagram. I shared pictures, recipes, and tips with my curious followers who were learning that gluten free food really is delicious. I also created a To Be Gluten Free Facebook page which caused more individuals to follow me. While I loved blogging about my adventures in the kitchen, I wanted to do more; I longed to sell my goods in order to fill my community's gluten free food void and spread awareness about gluten sensitivity. In the past year, I have become a vendor at farmer’s markets and culinary festivals across Long Island. Local stores in my neighborhood, such as Gemelli Gourmet Market North, sell my items and I bake for parties, events, and fundraisers as well. To Be Gluten Free has gained a steady following and has a large presence within my community. I am constantly introduced to new locations within which I can sell my goodies, helpful in reaching more customers and spreading awareness about Celiac Disease. Baking for the Glen Cove Culinary Delights Festival in May 2017. I feel as thought To Be Gluten Free grows everyday. Whether through farmer's markets, an increased social media presence, or word of mouth, my company is expanding in ways I would have never dreamed of. I am eternally grateful for the support I receive everyday, especially from people who express their thanks for my attempt to fill the unfortunate void surrounding gluten free food. Building To Be Gluten Free has taught me countless lessons about not only baking chocolate chip cookies, but leadership, determination, and persistence as well. I will continue to embrace all opportunities that come my way and hope that one day, To Be Gluten Free is a household name.